The first place your couples will look for your officiating services is online, and a professionally designed website is your greatest marketing tool. It gives your couples the opportunity to learn more about you and your brand and it keeps the doors to your business open 24/7. 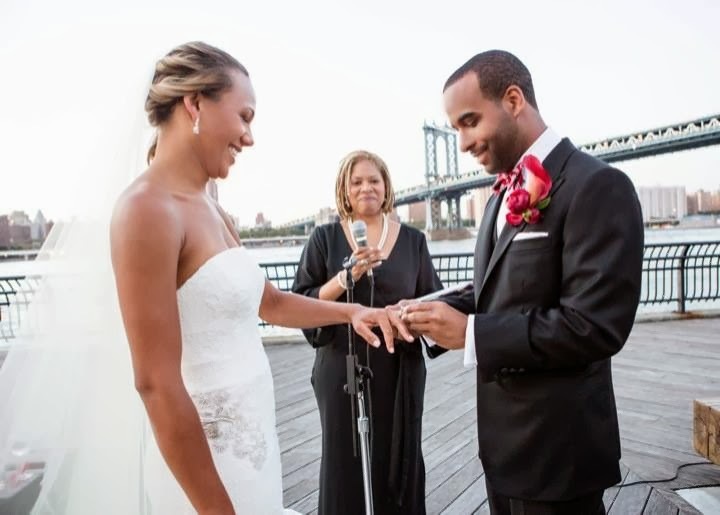 The Officiant Business School is pleased to offer professionally designed website services (Squarespace) for Officiants and Celebrants at a very special price point. The 6 pages can be whatever you want or they can be Home, About, Services, Portfolio, Prices, Contact. Professionalism: Every website design project is personally handled by Aretha Gaskin and none of it is outsourced or subcontracted. Cost: This price/cost is for Officiants and Celebrants only. If you have a different type of business, the price point is different. Contact Aretha to discuss your design needs. Platform: Website must be designed on the Squarespace platform. I do not work in/on any other platform. See Squarespace Templates here – they are amazing! Content: As you can see from the pricing above, there is a nominal additional cost for me to create original content for your website. Note: there is a lot of plagiarism in the Officiating space, do not do this. Coming along and simply copying another Celebrant’s content is outrageous and you can be sued for this. Get original content created for your business. Images: If your website needs images, see above for the nominal cost for stock images. Stock images can be use on your website (NOT for your portfolio) as you build your portfolio. If you're looking for a web designer that ticks all the boxes and delivers what they promise look no further. Aretha Gaskin is amazing and you would be hard put to find anyone prepared to put in as much effort as she does. Aretha is responsive and easy to talk to. Nothing is too much trouble and emails and queries are responded to within minutes. I am delighted with the website. I want to send a big thank you to her for making this process (one that I have put off for 6 years) a seamless and fun experience. Working with Aretha was a great experience. We laughed a lot during the process, and she was easy and smooth to communicate with. I let her know from the beginning that I am very picky and would have a lot of detailed input, and she rolled with me when that indeed was the case and she was receiving email after email with lists of things to change. She didn’t always agree with my desires, but implemented them anyway and even admitted in the end to liking some of the suggestions she had been wary of. She was also very realistic, and had good ideas for streamlining some of my more elaborate visions to make them work with the big picture. Aretha is knowledgeable, organized, efficient, offers competitive pricing, and is fun to work with. And most of all, I love my new website! I only have wonderful things to say about Aretha Gaskin. She is an amazing person to work alongside with to build your brand and website. She was so precise in her detail in building my website, and the best part she knows how to guide you. I chose Aretha from everyone else, because when I went into her business website and her social media pages she was precise in her detail and it catches your eye. Her detail was impeccable and straight to her work product. When working with her she is efficient, detailed and knows how to stay on a timeline with you. She pushes you to levels where you didn’t think of going to make sure you brand out your business website to the right market. Her references on how to brand out your business are up to date, and more than helpful. She actually takes the extra steps to motivate you to market yourself to the public in different ways. I didn’t see her just as a web designer, I saw her as a mentor. She makes you think and gets you to where you need to be by making you do a little research and homework, but it all paid off at the end. She knows how to attract the public eye by her marketing skills to attract people to your website. If you want someone who will deliver, she is your lady! She gets the job done and will until you are happy. She is professional in every manner. I am very happy I chose her to build my business website. I can’t wait to work on other projects with in the future. If you want a great job done, call Aretha Gaskin. Aretha is a delight to work with. My website is so much more than I expected and the turn-around time was amazingly quick. Every interaction with Aretha Gaskin has been exceedingly pleasant and professional. There is no doubt that she takes pride in her work and is committed to excellence. I love working with someone who shares these values and has a keen eye for the aesthetic and brilliant marketing insight. Aretha, thanks for making my website look better than ever. If you are looking for the best person to create your website, I recommend Aretha Gaskin without reservation. You are lucky to have found her!